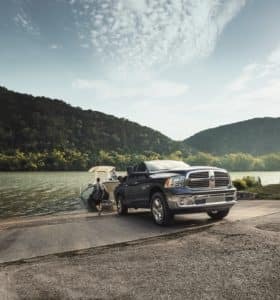 The Ram 1500 boasts powerful engine options, cutting-edge technology features, and an upscale interior, but one of its most impressive advantages is its incredible towing capacity. Truck buyers in Huntingdon, Cassville, and Mt. Union can learn more about the Ram 1500 towing capacity and towing features that enhance its capability. The Ram 1500 comes with several engine options. The entry to the lineup is a 3.6-liter Pentastar® V6 engine that uses a Thermal Management system for optimal performance, power, and efficiency. The 3.0-liter EcoDiesel V6 engine is the mid-level option in the lineup, and it produces 240 horsepower and 420 lb-ft of torque. Finally, the 5.7-liter HEMI® V8 engine is next up, which produces 395 horsepower and 410 lb-ft of torque. These engines mate to a Torqueflite eight-speed automatic transmission. Equipped with the proper engine, the Ram 1500 can tow between 6,280 pounds and 8,590 pounds. With the right configuration, the V8 can tow up to 12,750 pounds. Towing effectively requires more than just strength and power. With the right towing features, you have additional stability, safety, and confidence on the road. A fully loaded trailer can require a lot of power to move, especially if it’s on an incline. 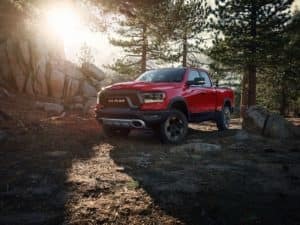 To combat this, the Ram 1500 comes with Hill Start Assist, which detects the truck on an incline and maintains brake pressure as you move from the brake to the accelerator, keeping your truck from sliding backwards. An integrated trailer hitch is included for all models as well, which seamlessly connects the truck frame to the trailer and provides a safe, secure trailer connection. This also works with the four- and seven-pin trailer hitch wiring harness and connectors with convenient bumper integration. Trailer sway control is another helpful feature for towing. This system detects a swaying trailer and automatically applies each individual wheel brake and reduces engine output to regain control of the trailer. All Ram 1500 trims are equipped with a rearview camera with a zoom function, which helps you view the trailer and truck bed, as well as makes it easier to connect the trailer. The optional surround-view camera takes this a step further, giving you a bird’s eye view of the area around your truck and trailer for complete awareness. Other advanced safety features are available as well, such as blind spot monitors, automatic emergency braking, and active lane control. These features are excellent to have on any vehicle, but they provide additional assistance when maneuvering and towing a loaded trailer, by giving you a better view of the area around your outfit and helping you maintain control. 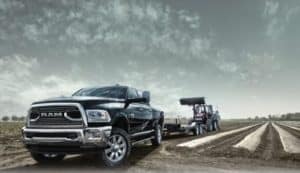 With its range of powertrains and mechanical upgrades, it’s no surprise that the Ram 1500 lineup packs an incredible towing capacity that can handle your toughest loads. The additional safety and towing features also help you tow with more security, convenience, and confidence. If you are a driver in Mt. 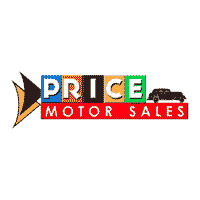 Union, Cassville, or Huntingdon, you can learn more about the towing capacity of the new 1500 by visiting Price Motor Sales. Call or stop by our dealership today to schedule your test drive!